Cafe de Chinitas is a flamenco restaurant offering Mediterranean cuisine. The average price of a 3-course meal at the Cafe de Chinitas restaurant is 65 (includes price of show) euros. Note that although GoMadrid.com strives to maintain all information about Cafe de Chinitas up to date, the prices mentioned are only an indication and may not reflect the exact value of your meal. El Cafe de Chinitas is in the grounds of an 18th century mansion house and is one of the most famous tablaos (flamenco restaurants) in the world. 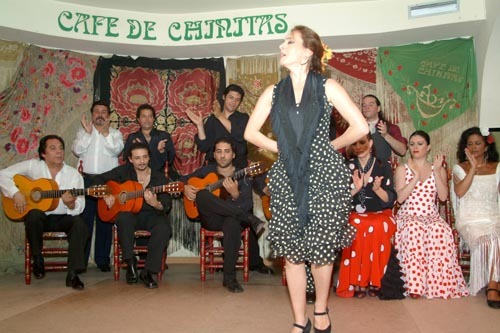 Located right in the heart of Madrid just a short distance from the Senate and the lively Gran Via, Café de Chinitas mixes international cuisine with wonderful flamenco. 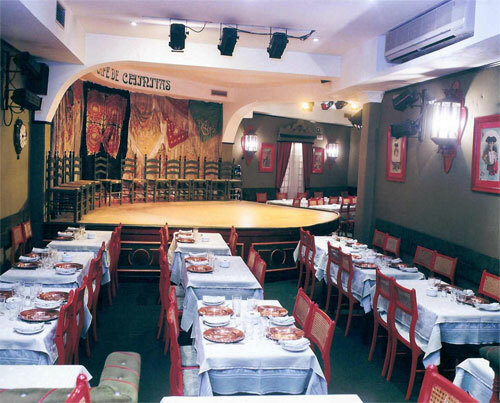 Well known flamenco artists such as La Chunga, Pastora Imperio, Enrique Morente, Jose Mercé, Serranito have all performed at this classic 40 year old venue of the Madrilian scene. The restaurant is popular with both visitors and locals and the restaurant dance troupe performs everyday with an invited guest star. The pice mentioned here includes entry fee to see the show. The address of the Cafe de Chinitas restaurant is: Torija 7, 28013 Madrid. The nearest Metro station is Santo Domingo. Please see the Cafe de Chinitas restaurant location map below.